Lyuba, the beautifully preserved baby mammoth that drowned in a muddy pool approximately 40,000 years ago, is the star attraction on a new Woolly Mammoth exhibition that will be making its debut at the prestigious Field Museum in Chicago (USA) before embarking on a world tour. This almost perfectly preserved frozen carcase of a one-month-old female Mammoth calf was discovered by a reindeer herder in the remote Yamal-Nenets region of Siberia in May 2007. An ear and part of the tail were missing, perhaps as a result of the body being scavenged by wolves before it was frozen, or perhaps as a result of the corpse partially thawing out before the herder found it. The baby Mammoth was named Lyuba, the name of the herder’s wife. It had been studied in Japan and several casts of the animal have been made. This calf is extremely important as it represents a healthy animal. Previous finds of baby Mammoths such as Dima were corpses of animals that were malnourished or ill when they died. Poor Lyuba got stuck in a muddy pool and drowned, so perfectly preserved was this specimen that scientists were able to learn a lot about Mammoths and their young. Lyuba will be the star attraction of a travelling exhibit on Woolly Mammoths, there are plans to have this exhibit tour a number of museums over the next four years or so. Her first stop will be the Field Museum in Chicago (USA) where she will be on display from March 5th 2010 until September 6th 2010. Not all the museums may be able to have the actual fossil of Lyuba, however, a replica model is available to help visitors to that particular leg of the tour, appreciate how well preserved this baby Mammoth is. “There’s a visceral awe that takes hold of you in looking at a specimen like Lyuba, and the exhibition as a whole demonstrates how close we can come to knowing what these animals were like”. As Lyuba was in good condition and healthy before her unfortunate accident, she has already taught researchers a lot about Mammoths and their young. For example, traces of her mother’s milk were found in her stomach and a store of fat at the back of the skull may have helped the young animal keep warm. This hump helped provide energy to the body and keep the animal warm in a cold climate. 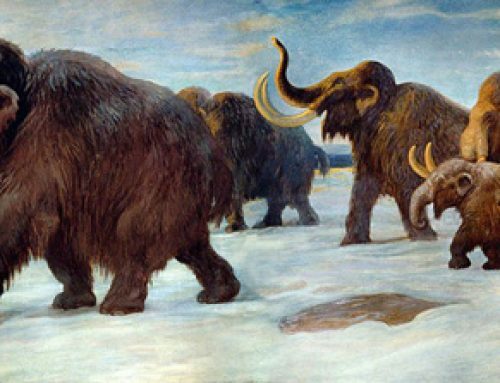 This supports the theory that baby Mammoths were born in the spring, allowing them enough time to grow and put on fat reserves to help them through their first winter. “We had no idea from preserved skeletons and preserved carcasses that young mammoths had a discrete structure on the back of the head of brown fat cells”. The discovery of Lyuba has fuelled speculation about the possibility of being able to clone a Mammoth from preserved DNA. Professor Fisher commentated that this particular fossil could yield DNA but “no one is on the threshold of cloning at this point”. After the Field Museum exhibit closes, Lyuba and the rest of the display items will be embarking on a 10 city tour, the final stop is scheduled for the London Natural History Museum in 2014. Dates have yet to be finalised, but as we write this blog entry we understand dates from May to September 2014 have been reserved for the Natural History Museum in London. The Natural History Museum’s exhibition team have discussed the possibility of the exhibit called “Mammoths and Mastodons: Titans of the Ice Age” coming to London with their counterparts from Chicago. Since the discovery of Lyuba, we have helped on the making of a new model Woolly Mammoth calf, this new model is not to scale but works well with the 1:20 scale model series from manufacturers such as Schleich and Carnegie Safari. The calf has been sculpted to show a much younger animal than the Schleich baby Woolly Mammoth calf. Where can I find the 2011-2012 tour schedule for Lyuba? Is a California appearance planned? We update our readers on tour schedules from time to time, as they are passed to us by the Field Museum in Chicago. The “Mammoths and Mastodons – Time of the Titans” is scheduled to be at San Diego Natural History Museum in 2013 (July 4th until October 6th). Is a California appearance of Lyuba planned for 2011-2012? The travelling exhibition is scheduled to be in California in 2013 (San Diego Natural History Museum). It is booked from July 4th until October 6th 2013. When dose Lyuba arrive Singapore? in 2012? Sorry, but we are not aware of the Mammoths and Mastodon (Time of the Titans) travelling exhibition going to Singapore. This exhibition is booked to tour the UK and Europe in 2013 and 2014 and we are not aware of any plans to have it visit Singapore. Will Lyuba be in San diego in 2013? the actual presered body? Itineraries for specific museum exhibitions as part of a world tour are subject to change. For clarification as to what will be on display and when at San Diego, we suggest that you contact the museum direct and make an enquiry. The touring exhibitions Mammoths and Titans of the Ice Age is currently in the UK, it will be at the Cleveland Museum in the United States from November 2014. It went to the Museum of Science in Boston MA back in 2012 it is not scheduled to go back to Boston. Will Lyuba , or HAS Lyuba ever come to the Franklin Institute, and if not will she be here in the near future? A team member has emailed you in person with the specific information requested. Sorry that would be the Franklin Institute in Philadelphia, Pa U.S.A.
You should have received an email from Everything Dinosaur containing helpful information. Will Lyuba come back to the United States? Possibly, one day, although we are not aware of any imminent plans. Will Lyuba be coming back to the U.K? As far as we are aware there are no plans to bring the Lyuba Woolly Mammoth exhibit to the UK for the time being. That’s ashame. I missed it the last time it came.